Favorite Line: My life is done. What yours will be I do not know... But short or long, joyous or agonizing, I ask you to choose life. More than a century has passed since the mighty struggle between the wizards and the mages ended in their mutual destruction, and more than forty years since the Empress Ouriána became the Divine Incarnation of the Devouring Moon. Appointing twelve deadly sorcerers as her priests, she rules the land in darkness unending. Yet there is a small chance for hope, if one foreordained princess can survive. But she has vanished behind enemy lines, and even a brave band of heroes may not be able to reach her in time. For Ouriána's dark reign has woken the ancient terrors of legend, and their vengeance will be swift and all-consuming. . . .
Wow, two book reviews in one week! I'm quite proud of myself. 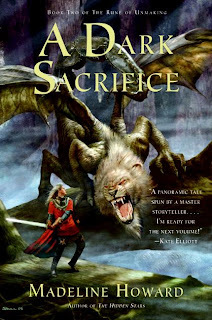 A Dark Sacrifice is the second book in the Rune of Unmaking series, following The Hidden Stars. The third book in the series has not been finished yet. Madeline Howard is a pen name for the author Teresa Edgerton, who has the honor of having created one of the characters on my Heroines Who Don't Annoy Me list to the right (Sera, from Goblin Moon). I also LOVE her Goblin Moon duology, and highly recommend it to everyone who likes Regency era and fantasy fiction. She can write a very, very good story. I also really liked the first book in this series, The Hidden Stars. I thought she did a very good job of creating a world for her characters to populate, and she also gave her characters depth. So I'm not entirely sure what I found missing in this second book of the series. I read it and enjoyed it, but I didn't fall in love with it. And I feel certain that by the time the next book comes out, I'll have completely forgotten everything that happened in this one. Granted, the second book in a trilogy is usually the weakest, as the least happens in it. The storyline has basically been set up, and we haven't yet arrived at the climax. I think "middle book syndrome" especially applies to those fantasy series (such as this one) which are epic in nature and involve quests of some type. Because really- who wants to read an entire book about one set of characters following a different set of characters and never quite catching up? It's depressing. And often makes me wonder why authors can't just condense that whole "Oh, we almost caught them but we missed them again, so let's just keep going!" feeling into the other two books of the series. That's not to say that nothing happens in the book- and who's to say that the events of this novel do not heavily influence the next one? Maybe everything will become clear at that time. There is some character development, especially in a certain female character who appears to have Stockholm Syndrome by the end of the book. And one of the side characters gets his memory back, which is sure to be a big feature in the next book. I think I can't fully judge this book until I read the third one. Because the second book in a trilogy, as I said, is often its weakest, but if the whole series is good, then it's worth getting through the second one :-) And I have full faith in Madeline Howard (and Teresa Edgerton) to tell a good story- she has done it many times before. So... here's hoping the next book comes out soon enough for me to remember the first two when I read it!